You are browsing the archive for Community Stories. As we approach the final days of this year, we would like to say thank you to everyone who supported or attended an Open Knowledge event and helped to build on the ideas and actions for a more open government and an Irish open data agenda that has the citizen at its forefront. 2016 has been an extraordinary year for Open Knowledge Ireland – It was a year in which we dared to ask for Irish hospital waiting lists to be published as open, accessible data and we have achieved this right before everyone went on their well-deserved Christmas holidays (Link). We have been advocating that for open data to be useful and to make a difference in the lives of people it has to be put in use. In order for businesses, civic groups or individuals to invest their time, talents and money into making open data useful, it must be seen as a digital public infrastructure and it must be permanent, linkable and trustful. The Open Knowledge volunteer team organized and participated in events tried out new technologies and demonstrated the usefulness of open data. In JANUARY, in collaboration with Wikimedia Ireland, we facilitated an open platform and debate on how open health data can save lives and help all of us to make better-informed decisions about health matters. We presented how IPFS can be potentially used for long-term data preservation. ☑︎ In Dublin on Thurs, 21st? ☑︎ Want 2 know how #IPFS works? In FEBRUARY we shared our open data experiences [slides] and vision [slides] for long-term knowledge preservation with a delegation from NTT, Japan, which was visiting Dublin. In MARCH the Open Government Partnership Mid-term report on the progress of the Irish National OGP Action Plan was launched. In AUGUST we helped to map the Kingdom of Lesotho at an event dedicated to the 10th anniversary of the open street map which was kindly hosted by the Embassy of the Kingdom of Lesotho in Dublin. In SEPTEMBER and continuing to December we contributed to the second Irish Open Government Partnership National Action Plan ensuring that plans are shared with a wider audience. Alongside a host of other organizations, individuals and companies we made several submissions to the drafting of the OGP Action Plan and in 2017 we are looking to help establish a set of guidelines for citizen participation in order to build an appropriate accountability mechanism for its implementation. Our submissions are here. In OCTOBER we co-organised a half-day workshop together with the Institute of Public Health dedicated to “Open Access: Tackling Health Inequalities”. The outcomes of the workshop showed that the technological advances of today are giving rise to a growing catalogue of international best practices and opportunities for making knowledge universally fair, accessible, interoperable and reusable. In NOVEMBER our colleague Dr. Ingo Keck delivered a presentation on the challenges the open data agenda faces today. At an event in Berlin dedicated to World Usability Day, he raised important questions about the sustainability of open data beyond today and tomorrow. What are we planning to do in 2017? In 2017 the Open Knowledge Ireland team are going to focus their energy on Healthcare data and making it relevant and useful to the Irish people. Our team will concentrate on planning and run 4 events aiming at working closely together with DPER’s Open Data Engagement plan, the NTPF, and the HSE and continue to demonstrate how open data can save real-world problems. We have a long way to go until Open Data will become a critical public infrastructure in Ireland and beyond: permanent, linked and secure. Open data must be accessible, interoperable and findable in order to help a real person to make decisions on the daily basis. It is clear to us that such an infrastructure needs to be designed, built and maintained, which requires human and financial resources. So in 2017 we want to do a whole lot more and we would love if you might contribute a small gift to help us do that. Your support will help every element of our work in the new year and support Open Knowledge Ireland as a hub for individuals, organizations and their ideas that form a major driving force of the open data and open government agenda in Ireland. And we look forward to seeing you at Open Knowledge events and initiatives many times in the New Year. With thanks to our Open Knowledge Ireland colleagues: Flora, Salua, Ingo, Adrian, Shawn, Stan, Eugene, and Denis. And many thanks to our everyone who collaborated with us in 2016, especially Open Street Map Ireland, WikiMedia Ireland, the Institute of Public Health, TCube, and the Science Gallery. We hope you all had a great Christmas time and we wish you the very best in 2017! First and foremost, the timing couldn’t be better. ICANN is right now in the progress of updating and reviewing its internal bylaws, and this process is called Workstream 2, or WS2. The bylaws are used to control the decision-making process within the quasi-private oversight group, that is ICANN. I probably don’t need to elaborate on the speed of massively growing Internet to this audience, but I’ll do it anyway; Apparently, we created more data in 2013-2014, than all the previous years put together, and it seems we’re still very much in the accelerating growth phase of the Internet. As it is, the access to the data that the governance of the Internet creates is almost non-existent. I think there could be a treasure trove of information to be used for the improvement of the global Internet community, as well for scientific research. ICANN holds the keys to a central point of communications like no other entity in the world. Likewise, the culture of transparency could be massively improved, and that is the name of an actual subgroup within the WS2-process, that was kicked off in the ICANN56 in Helsinki this June. My suggestion is for the OKI to join ICANN’s Non-Commercial Stakeholder Group and contribute in formulating the transparency bylaws with other members of the NCSG. The size and breadth of OKI make us a valuable member to ICANN. Their triannual conferences take place all over the world, rotating in turns to different continents. This would give a global organisation like ours, the chance to participate live almost every time with minimum expenses. The conferences themselves are free with food and drinks. The networking possibilities are simply too impressive to ignore. If we can contribute in the work of ICANN, I am sure we can grow our network of member countries and individual participants as well. The Open Government Partnership (OGP) is premised on the notion that sharing success stories can encourage further experimentation and reform. This is certainly true with parliaments, where the Legislative Openness Working Group (LOWG) has repeatedly witnessed the value of sharing information and experience. To ensure that good practice is effectively captured and shared, the Working Group has collected comparative, global information on legislative openness practices. That information, which was gathered through an open survey process, is now publicly available. Interested in comparative information on legislative openness? Curious about global good practice? Analyse the collected information, download the raw data, or contribute to this growing database at: beta.openparldata.org. Capturing and compiling good practice can help advance reform efforts. By offering inspiration and guidance, these success stories can encourage reformers to follow in the footsteps of their colleagues. Comparing performance around the world or within a specific region can also be a useful incentive to catalyze reform efforts and empower open parliament champions. For the Open Knowledge network, this website can serve as a jumping off point for further research into legislative data availability or advocacy around access to legislative information. Inspired in part by the Open Data Index, this crowdsourced effort represents an attempt to assess availability of legislative information. Parliaments, as the representative organ of government, stand to benefit immensely from more fully embracing open data and play an enormous role in creating a broader culture of openness across government. Hopefully, this website can inspire and inform further work in this area by members of the community. Please note that the site is currently in beta, and the administrators expect additional changes to improve functionality and further clean the collected data. If there are specific features you would like to see added, or existing features you would like to see changed, please reach out to: admin@openparldata.org. This is very much a work in progress, and your contributions and suggestions are hugely appreciated. The Legislative Openness Data Explorer provides global, comparative information on legislative openness practices. The current dataset focuses on legislative transparency, specifically what types of information are available and how the public can access that information. The core feature of the site is a customizable data table and map that presents the collected information. Using a red, yellow, green color scheme, the Explorer offers users a general summary of performance on a particular issue. For more detailed information, users can click the colored icon to see additional, detailed information. For those interested in specific countries or regions, there is the option to generate a unique map. These visualizations make it easy to compare performance between different chambers of parliament on specific issues, either regionally or globally. Thirty one chambers of parliament are currently covered on the site, though the administrators anticipate that many additional countries will be added in the coming months. If you are interested in adding data for a new chamber of parliament or country, please see this page. During Global Legislative Openness Week 2016 (GLOW), the Working Group will lead a campaign to collect information on all OGP member countries. 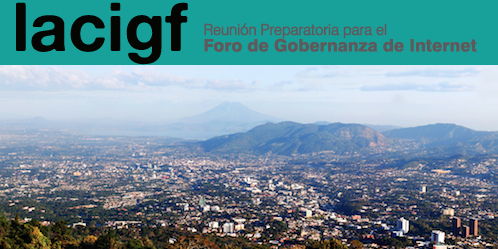 The website also includes a collection of good practice examples, drawing on the OpenGov Guide and related resources. This is of course an incomplete list, and users are able to submit additional examples here. This section is intended to help inspire and guide reform efforts. If you are interested in committee transparency, for instance, this tool will provide you with a growing collection of examples in that area. It is important to note that this site is a work in progress. The site administrators anticipate making continual tweaks and improvements to the site and would welcome thoughts, comments, or questions. Additionally, users are able to submit new information on countries not yet covered, suggest edits to the existing data, or contribute a good practice example. For more information on how you can contribute, see this page. This resource was created by the global legislative openness community, and its usefulness will rely on the community’s continued engagement and support. For more information on the Legislative Openness Data Explorer, please see this page. The Working Group would like to thank KohoVolit, a Czech and Slovak parliamentary monitoring organization, for their efforts and support. KohoVolit was responsible for building and supporting the design of the site. 2015 was a great year for Open Knowledge, full of opportunities and challenges. We started many exciting new projects such as Open Trials, Budgets EU and the Route to PA, we had personnel changes (and a new CEO, Pavel Richter), and also we’ve refined our name to Open Knowledge International. In addition, we developed a community roadmap to help and strengthen the Open Knowledge Network and move it towards self governance and more effective collaboration in 2016. Why do we need a community roadmap (and how is it different from a strategy)? Building a community roadmap for communities of knowledge and tech is hard work. Most guides for community building on the internet look at community members from a commercial perspective as users of a product or consumers. In the case of the Open Knowledge Network, we see our community members as influencers, innovators, contributors or leaders in their thematic and/or regional communities. What unites us is a common purpose of learning, sharing and creating powerful new forms of open knowledge. In the last two years we saw steady growth in the Network. In order to accommodate the needs of the evolving network, we should adapt and improve how we work together. We look forward to embarking on that journey with you. The community roadmap examines 8 different competencies and allow us to reflect on our work and make it even better. It looks at Strategy, Leadership, Culture, Community Coordination, Content & Programming, Policies & Governance, Tools and Metrics & Measurement. The roadmap work will help us align priorities, better organise and plan within the network, communicate values and value throughout the Network. This is why we decided that the first quarter of this year will be dedicated to community and network reboot. 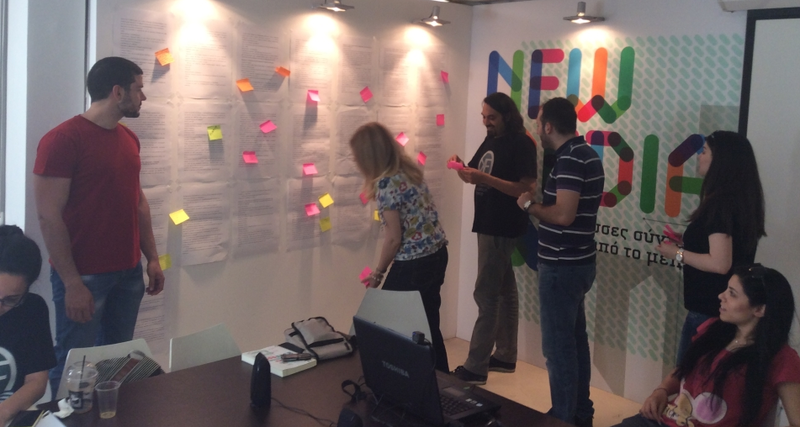 We see the Open Knowledge Network as a place for exchanging visions and ideas. We see Open Knowledge International as a central body that creates some of these ideas, but more so as a place that helps make connections between people with similar ideas, and helps promote other ideas and connect people from different parts of the network. Every journey begins with a single step, so we decided to start with the basics: updating the network structure and procedures, taking into consideration every competency of the roadmap. In the next couple of weeks we will clarify our policies about how can anyone be a part of the Open Knowledge Network, either as a local organiser, or a leader or member of a local group or a chapter. We are clearly defining the responsibilities that each role has, and also adding the support that Open Knowledge International can provide at each level. We want to set clear expectations and continuously strive to work better together. Until we will have clarity on those policies, we will not be able to process any new applications for local organizers / ambassadors. We will get back to those applications in March. This month we will also take care of some long needed content updates to our website, newsletter, and blog, promote more widespread use of our discuss forum and refresh and rethink the use of our different wikis. This will all be done in coordination with the Network: we will share the guidelines for a community consultation on the guidelines our discourse forum. All members of the Network are welcome to participate. After the consultation is over, we will publish these guidelines on our website , hopefully by mid February. We will update on the development of the community roadmap regularly. Be sure to follow our Twitter account and the community forum to get updates on time. As of January 1st 2016, Neal Bastek and Mor Rubinstein are working as the community coordinators / facilitators. Please email them at network@okfn.org for more questions or just raise them in the community forum! Looking to hear your feedback and hope that this will take us one step forward as a community. Since a new government took office in Argentina, a party alliance called #Cambiemos (Let’s Change), a lot of things have changed. Less than one month has passed, and a lot of new directives (more than 40, some of them of the Urgent & Necessity kind) have been passed by the new administration. Since the congress will reopen only in March, and the judiciary system is on leave until February, most of the announcements and deep political changes have been issued as government official orders: Decretos. This implies that these changes are instant, but those directives could be challenged by the legislative branch later this year (and they probably will be). The Decretos thing may not be so important to foreign readers, but most of the #Cambiemos campaign was based on the premise of being respectful to the Republic Institutions, meaning to go “by the book” and to legislate bills about important topic in a democratic way. Now, during the warm months of the southern summer, a philosophical debate arises: Form vs content. End goal vs means. Decree vs Debated Law. This debate crosses the political spectrum that goes from the fanatics of the former government, now turned ‘opposition’, and the ones from the new administration, now ‘officials’. This debate does not discriminate and embraces almost all current political events. The Macri administration presents itself as The One who will bring order and light into the state. With only one month in office, and during the summer recess, they already started revising previous contracts with private enterprises, laws regarding the telecommunication monopolies, and firing lots of employees that were contracted in precarious and almost illegal ways by the state. If the previous administration had had better transparency and openness, we could be controlling how much of this “tidying up the mess” process is real thing, or if it’s just an excuse for lowering the state budget and adding even more precarization of the job market. It is not wise to hand over a state administration with lot’s of hidden numbers and unknown indexes, as it gives free play to the next in office to blame “la pesada herencia” (the heavy legacy) of the last one in charge, and do whatever they want with the excuse of fixing previous mistakes. Crude example: As the inflation index since 2007 have been untrustworthy, the new government will need some time to build a good one. Till then, we won’t have even a fake one. And it will probably be the highest inflation times of the last two decades. The Modernization Minister announced this week that the new government is willing to move forward in the Open Government agenda, including Open Data portals and policies, open contracting and more open initiatives. How this agenda has been promoted? Of course, with a governmental official order, or Decreto. Some will say that it’s just espejitos de colores (Spanish expression similar to ‘snake oil’), or that it’s just a gesture to make the open data fans happy. However, we cannot deny former experience of the new national administration: As the City of Buenos Aires government, they created one of the most advanced policies in the country related to open data. They built an egov initiative, they assembled a really innovative GovLab, and developed lots of open data and online citizen participation tools. If we compare Buenos Aires City to the rest of the cities and even the national level, it ranks at the top. However, if we compare the openness of Argentina with the rest of Latin America, we end up in a really bad position. And that’s even if we only compare ourselves to our smaller surrounding countries of Bolivia, Chile, Paraguay and Uruguay, usually thought to be behindhand. 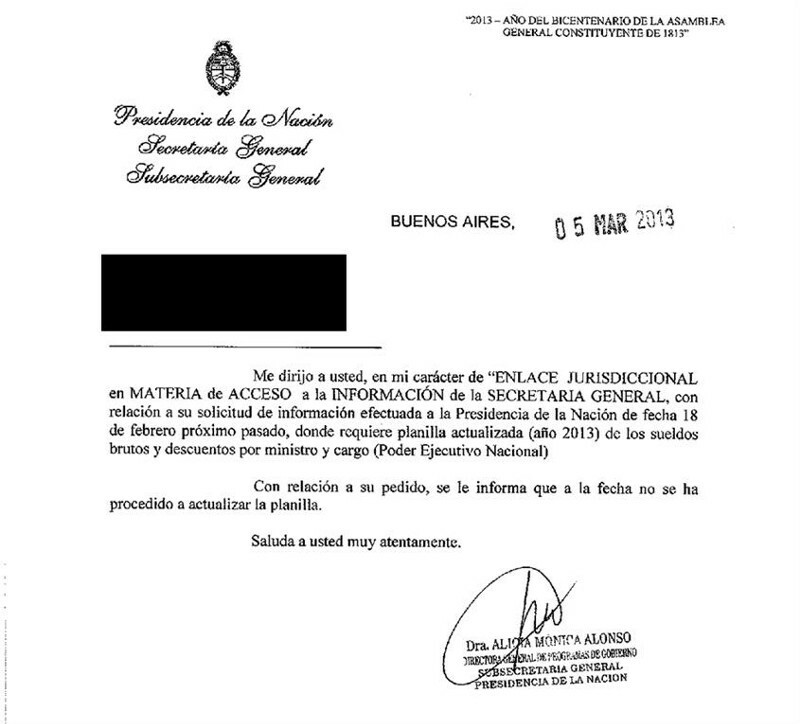 The President office in 2013, replying La Nacion’s Journalist @colmanromi that “the President’s salary datasheet wasn’t updated yet” when they erased one column of it to hide the actual salary. For the last few years we didn’t even knew the poverty level. La Argentina está en el puesto 54 en el ranking de apertura de datos públicos. Nuestro objetivo es estar entre los 10 primeros del mundo. Andres Ibarra, the Modernisation Minister, expresses his wishes to get into the top ten open countries in the world, at least in the Global Open Data Index. Even though this is not a vanity contest, we all share his wish to overcome years of delays and obscurantism. 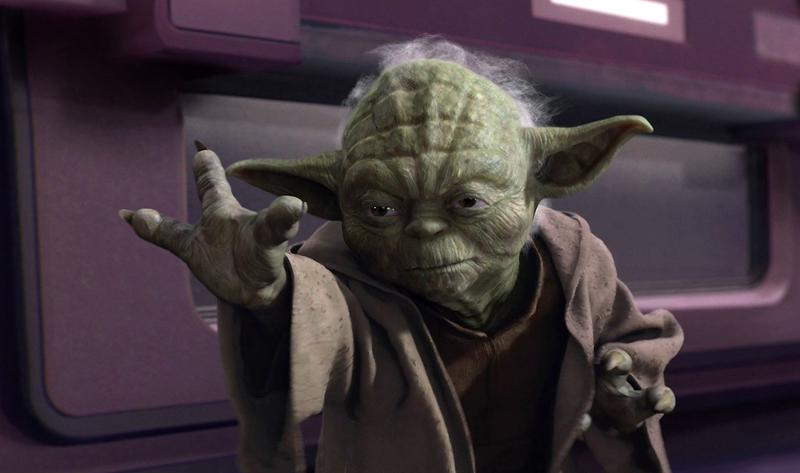 We know that the new government has lots of good, talented people pushing into the Open Side of the Force, not only in the technical but also in the political levels. However, we also know that the main party leading the #Cambiemos alliance has lots of politicians relying their power in non-open contracts, opaque ways of working and occluded information. That’s why we are happy with these announcements about moving into the openness, mostly because it demonstrates the political will of pushing forward an Open Government agenda, and because they are putting it out in the open, for everyone to learn about it (not only the NGO’s, CSO’s and nerds). But we are still suspicious about how much will actually change. That is also why we should keep pushing for a Free Access to Information Law to be discussed and legislated in the congress. Because a government order may be a good starting point, but we need something that makes transparency and openness a must, in all levels of the state and territory as well as something valued not just by the Presidency and his decrees but valued by the Argentine government as a whole. That’s why we should use this new momentum to show to the rest of our society how important this is. How it can help to fight corruption, improve participation, discover and implement best practices and even build jobs around opened data. 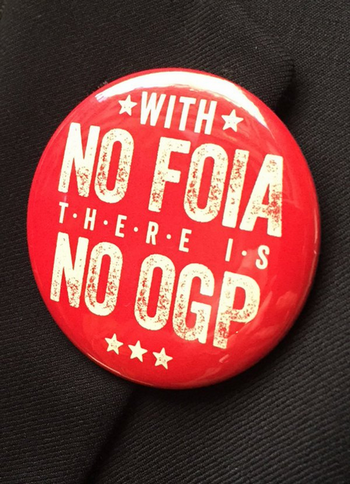 Happily, inside the recently elected new congress, we have new voices pushing for a FOIA law, which will join the former ones and maybe bill it this year. We should support the sectors of the new administration that are willing to push forward the Open Data and OpenGov movement. We should also keep an eye on them, using the same tools they are giving us. We should keep fighting for a real Access to Information Law , and when the discussion gets into the law making machinery, we as civil society must continue to participate and make our voices be heard. But most of all, we should keep spreading the word with our colleague citizens, sharing the pros and cons of this Open movements, teaching about privacy concerns and limits, helping them not to be afraid, and willing to use all of this openness to let the government know that we will be watching them! Here is where I start thanking Mor Rubinstein and for Anca Matioc being my editors in this post and end up inviting all of you to share your opinion on the subject, my point of view, or both. One of the best opportunities that being part of a community offers is the chance to collaborate and make things happen together – and when we want this to happen in sync, what’s better than convening an (in person or online) event? Just before the end of the year, let’s collect a few highlights from the Open Knowledge Community events you posted about on the Community Stories Tumblr (so nicely curated by Kathleen Luschek of the Public Library of Science – thank you!)! Joseph De Guia, Open Knowledge Philippines local group ambassador, TJ Dimacali, journalist and media manager, and Happy Feraren, School of Data Fellow participated in the festival exhibition and lightning talks series spreading the word about the Open Government Data, Lobbying Transparency, Open Education, Open Spending working groups and the School of Data programme. Find out more about it here. Open Knowledge El Salvador local ambassador Iris Palma, joined the panel focusing on Open Data and Open Access together with Caroline Burle from W3C (Brazil) and Pilar Saenz from Fundacion Karisma (Colombia). Further information about the event can be found here. More from El Salvador: I Encuentro por el Conocimiento Abierto! In line with the OKFestival (in Berlin) and the Latin American and Caribbean Internet Governance Forum (in San Salvador), Open Knowledge El Salvador, Creative Commons El Salvador and Association of Librarians of El Salvador celebrated the first Open Knowledge Meeting in El Salvador). 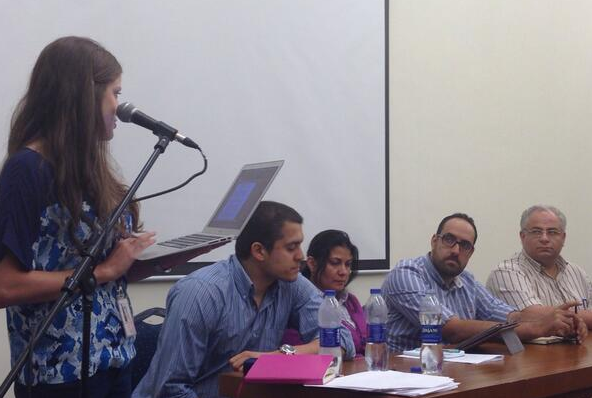 The event focused on Open Knowledge, Open Data, Creative Commons Licenses, Open Education and the Declaration for Open Knowledge in El Salvador. Congratulations! Open Knowledge Greece organized an open workshop to discuss and propose the positions and proposals of the group on the National Action Plan. Please find here all comments and suggestions that were stated in the meeting, published in both Greek and English. Comments Off on A round-up of Open Knowledge Community events around the world! Stories wanted! We’re building a community storytelling team starting with OKFestival. Whether you are in Berlin for the big event or across the globe, our goal is to co-create and compile all the best OKFestival Stories. Many of you tell stories with video, photo, images and text. Some of you are master wordsmiths and aggregators. One could even opine that hardware, art and code are very much stories. Well, at OKFestival we will run the gamut of all things open from science to education to balloon maps to budgets and graffiti. The community will be sharing content across many tools using many methods. We are building an in person and remote Storytelling team to capture all the gems, visions and tidbits. Even if you are not at the event, you can be our eyes and curators. If you can’t join the hangout, please be sure to reach out to heather.leson AT okfn DOT org or neal.bastek AT OKFN DOT org. We’ll be sure to brief you and collaborate on the next steps. Does your video or photos look like this? While it is super artistic, it might not show your story in the best context. While the camera for this session was not playing nice, the content is full of all kinds of tips and resources to make your video shine. Thanks to Sam Muirhead of Camera Libre for donating his time. See the G+ hangout notes for a stack of resources to help your video learning. Note: Community Sessions are taking a break for the summer. Stay tuned for more sessions in the future. Last month we asked the Open knowledge community to start sharing more details about the events we all run, to discover how many people are rocking Open Knowledge events all around the world! The community has been great at responding the call and now we’re glad to feature some of the April events we got reports (and pictures and videos!) from. The winners of the Apps4Greece award have been announced! Check out the winning apps, aiming to improve the functionality of cities, businesses, services and develop entrepreneurship and innovation. Organised by Open Knowledge France after the Paris Open Government Conference (April 24-25) during which France announced it’s joining the Open Government Partnership – and gathering more the 50 people! 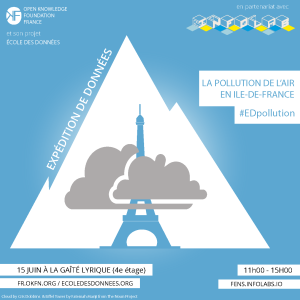 Featuring Open Knowledge founder’s Rufus Pollock and discussions about the state of Open Data in France, Open Data Index, French version of School of Data Ecole des Données (congratulations!) and more. Open Access Days in Egypt (Cairo, Egypt – April 27-28) Open Knowledge Egypt, among many other organizations and researchers, participated in the 2-day event driven by the aim to promote open access to researchers in Egypt and the Middle East, and plant a seed for future initiatives. So, what you’re waiting for? It’s time to share your stories for next months’ global roundup! Please submit your blogposts about your May events to the Community Tumblr (details about how/where here) by June 4 in order to be featured in our all-star monthly wrap-up to be published in June on the main Open Knowledge blog and channels! Thank you! We’re looking forward to hearing from you!